We’d love your help. Let us know what’s wrong with this preview of Green Lantern/Superman by Neil Gaiman. Berlin 1949. The drunken Janos Prohaska and Weng Chan of the Blackhawks go down into a deserted bunker and find some corpses in strange costumes (apparently the Justice Society of America) and a strange green lamp. Today. Hal Jordan is feeling lonely, and visits Clark Kent for a chat. They accompany each other to a museum convention Clark is supposed to cover for the Daily Berlin 1949. The drunken Janos Prohaska and Weng Chan of the Blackhawks go down into a deserted bunker and find some corpses in strange costumes (apparently the Justice Society of America) and a strange green lamp. Meanwhile, the Phantom Stranger sits in the apartment given to him by the Lords of Order, his current masters. Sensing that something else needs his attention, he finally leaves the apartment forever and dismisses the Lords. Now and forever, he is on his own. Superman and Hal have wound up in Hell, where Superman's super-senses can't experience anything but suffering, fear and pain. Horrified by realizing that he can't save these innumerable souls, he is slowly going mad. The catatonic man of steel can't do anything but float around and cry, while a terrified Green Lantern desperately tries waking him up. When the two of them are attacked by blood-thirsty demons, Hal once again uses his ring, and they disappear. Superman and Green Lantern encounter the power that killed them - the sentient Green Flame, the remains of the magic energies of Maltus. The Green Flame explains that their deaths were a result of Jordan trying to load his scientific ring with supernatural energies. Then it tempts Hal to give in for the supernatural power of the Green Flame instead. At that point, the Stranger appears, and teaches Hal how to tame the corrupt Flame. 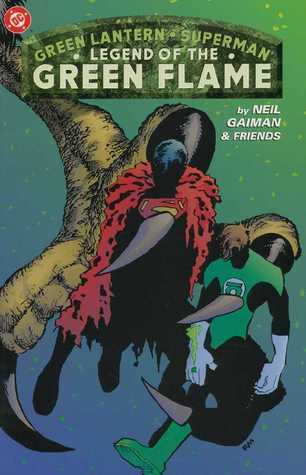 Hal reads the oath of Alan Scott, loads his ring, and the threat of the Green Flame is neutralized. The Stranger then returns Hal's and Superman's souls to their bodies, disposing of the lamp. To ask other readers questions about Green Lantern/Superman, please sign up. This story is collected in The DC Universe by Neil Gaiman Deluxe Edition, and I am reviewing it separately as part of my Superman 80th anniversary read-a-thon. 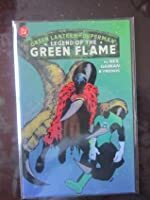 Picking up Legend of the Green Flame, I was mostly curious about how Neil Gaiman would write a comic using such classic straightforward superhero characters as Green Lantern and Superman. Turns out, it's just like most any other Neil Gaiman comic — weird, dreamy and centered around death. So one day Hal Jordan was feeling lonely and decided This story is collected in The DC Universe by Neil Gaiman Deluxe Edition, and I am reviewing it separately as part of my Superman 80th anniversary read-a-thon. So one day Hal Jordan was feeling lonely and decided to call his pal Clark Kent to hang out. Naturally, they go to a museum (ugh, NERDS) where they stumble upon a green lantern that belonged to the original Golden Age GL, Alan Scott. Something-something happens, and Hal and Clark end up being a little bit... dead. So... I didn't like this comic very much. The story is actually very thin and doesn't make much sense, and I feel like it exists mostly to showcase brilliant talents of the numerous artists who worked on different parts of this story. The art is where this comic truly shines — Eddie Campbell, Mike Allred, Mark Buckingham, John Totleben, Matt Wagner, Eric Shanower, Jim Aparo, Kevin Nowlan and Jason Little all contributed a few pages, and they all look great. I was especially impressed by Eric Shanower's rendition of Hell/Abyss, there were some absolutely stunning visuals there. But when it comes to the story itself, I just don't think that Superman and Green Lantern are a good fit for this distinctively Gaiman-esque tale. It didn't say much about Hal, and even less about Clark other than that he feels bad for all the people who suffer in hell. The best part of the comic was when we saw those two as just dudes trying to hang out despite them being totally different people, but there wasn't nearly enough of that, and entirely too much of surrealism and mythology. A fun, quick, and thought-provoking short story. Even though this early Neil Gaiman story is set in a world of superheroes, it frequently veers into the mythic--Neil just can't help himself. It's in his blood (and I'm thankful for that blood). The most interesting idea here for me was placing Superman in Hell (if briefly) and seeing what might happen. It actually reminded me a bit of Tolkien's weeping goddess Nienna in The Silmarillion, though not nearly as haunting and beautiful. The characterization is good, the dialogues are solid, the wit is there. Its good really, but its forgettable. It's pretty much Superman and Green Lantern jumping from one plane of existence to another, and while that may sound interesting, its mostly dull and anti-climactic. There is, one truly brilliant moment in the book. Superman in Hell! That was an experience, I don't want to spoil it. The whole book could be about Superman in Hell and it would be a lot better, Supe Weird story to classify. There is, one truly brilliant moment in the book. Superman in Hell! That was an experience, I don't want to spoil it. The whole book could be about Superman in Hell and it would be a lot better, Superman meeting Dante's Inferno. Unfortunately this great bit ends quite quickly but it left an impact. A nice quick read with nice art, if you've ever wondered how Neil Gaiman imagines Superman would react to Hell, here's your answer. This story was a B-, largely I think because it was written in another time, within a specific context. Outside of this context, it sort of loses its punch (I think). Read the foreword by Gaiman and the afterword by Waid. They explain the story of this lost script that was supposed to have been the final chapter of the ill-fated "Action Comics Weekly" experiment of the late 80's. Their stories make the actual story much more enjoyable. Another great moment was the scene of Superman in Hell. If you This story was a B-, largely I think because it was written in another time, within a specific context. Outside of this context, it sort of loses its punch (I think). Another great moment was the scene of Superman in Hell. If you stop to consider it, what would that really be like? I think Gaiman does an admirable job of showing one possibility. Despite the all-star cast of illustrators, the overall effect was more distracting than interesting. The line-up included Mike Allred and Jim Aparo, but seemed like a gimmick, though I don't think that was the intention. Not essential but a decent read. Feels like a companion volume to Alan Moore's Whatever Happened to the Man of Tomorrow.Superman: Whatever Happened to the Man of Tomorrow? Lindas historias, lindos dibujos. No es de lo mejor de Gaiman pero no deja de ser un muy buen comic. Puntos extras por la anécdota de cómo se recuperó el guion perdido. Creo que lo reeditaron en "Leyendas del abismo" de ECC, después tendría que corroborarlo. I'm a sucker for odd pairings. This was a quirky buddy story following Clark Kent and Hal Jordan. It was weird and it worked for me. This book was not so much relevant to my interests. There was nothing really wrong with it, I just didn't care. Historieta de Superman y Green Lantern escrita por Neil Gaiman y dibujada por varios artistas. Loved the personal moments of friendship. An interesting read, though, not being very familiar with the Green Lantern, it's a little lost on me. I particularly like the panels featuring Superman's reaction to hell.